A Journey Through Learning offers lapbook resources for unit studies and other topics. They also offer lapbook kits to go with Apologia elementary units and Geography Matters units. Most kits can be ordered as a download, a CD, or fully assembled. Pros: Great lapbooking & notebooking pages -- ideas you'd do yourself *if* you had time. E-book downloads! Cons: None that I know of! We used the Lapbooking/Notebooking pages that go along with TruthQuest History — American History for Young Students. My son loved the simple lapbooks and projects that helped him to cement what he had read about for his History lesson. Looking back through his notebook, he could easily remember the stories/history he learned from the lapbooks he had done. I love journey through learning. Several of my children are hands on learners, lapbooking is great for them. Their new digifolios are great as well. I also like that they have lapbooks for other curriculums we are using, it is great to be able to put the two resources together. Cons: they don't have enough titles! 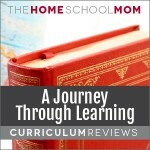 Journey Through Learning lapbooks are one of my favorite lapbook publishers. They are high-quality and professional. I like the colors, the variety of different lapbook elements, and the ease of use of the PDF versions. There are several titles available, but I wish they had a larger list published. Our family purchased these particular units/lapbooks: Overview of the 17th Century (lapbook and unit), Overview of the 18th Century (lapbook) and we really enjoyed using/learning from them. My children were first introduced to lapbooks using this company’s products, and compared to other companies, I really like their organizational set up and layout better than any of the other companies. To me, it just seems logical – the reading followed by the activity/lapbook component. Some other companies have the readings grouped together and the activities grouped in a separate section. For our family – it just flows better with the way A Journey Through Learning has them set up. It’s also great for the workboxes system too – the child can just pick up the notebook, go to that day’s assigned reading then do the activity/component without having to have an adult hovering constantly about. I bought the lapbook that corresponds to Apologia’s Creation through Astronomy and I am using this with my 1st & 2nd grader. The whole thing has awesome instructions from the way to fold the folders and attach them together in the 3-ring binder to each way the mini books need to be folded and where to glue them. This is a great visual for my students. As with other lapbooks we have done, I have found myself cutting out all the mini books and writing down what the student dictates to me. They are really enjoying each days activity and are excited to share their completed projects at the next coop show & share.